Jambeaux, everyone!!! Harambe! In the Queue, we talk about the latest rumor to come out involving the possible restructuring of the Magic Kingdom security checkpoint. We also take a little time to address a couple of listener emails in Guest Services. BUT, in the Hub, we present a Preview of Pandora from the World of Avatar coming soon to Disney’s Animal Kingdom in the Walt Disney World Resort. On today’s show, we present Danny, Kevin, and Eli of Ivory Comics. In Guest Services, we recognize the following MOWicans and address the emails they have sent in: Rick Suero, aka Big Money Grip and Elizabeth Rasmussen aka The Raz. 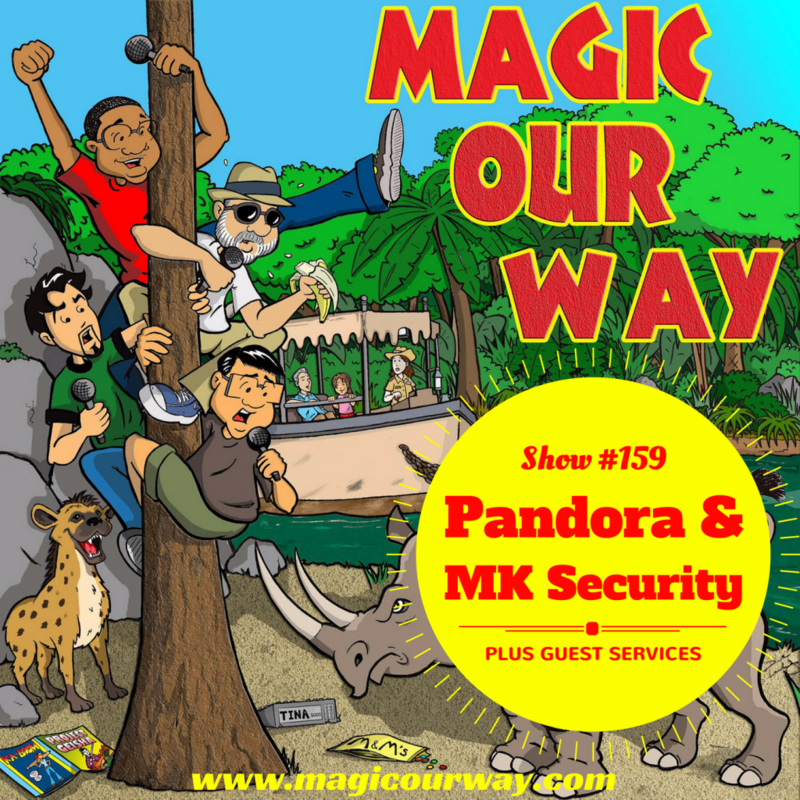 In the Queue, we talk about the latest rumor to come out in the Disney fan universe: the possible restructuring of Walt Disney World’s Magic Kingdom security checkpoint. We reference the article below. It seems like they are contemplating moving the security checkpoints closer towards the beginning of your journey to the Magic Kingdom. So, commuters/daily parkers would encounter the checkpoint at the Transportation and Ticket Center. Hotel Guests would encounter the checkpoint at their respective monorail stations. Guests arriving by bus will encounter the checkpoints closer to the bus station. It seems like this is a move to alleviate congestion just before the gates at the Magic Kingdom park. For today’s Hub, we give you a Preview of Pandora in Disney’s Animal Kingdom, a place that immerses you in the World from Avatar. Back on March 23, 2017, numerous videos and articles were released taking you behind the scenes of Pandora with Joe Rohde and other various Disney employees. We are allowed to see the floating mountains and parts of the two ride attractions including the pathways and restaurants. Below are some of the videos available to you that we reference in our show. Also, on this day, passholder preview dates were announced. Refer to the article below. The bulk of our discussion centers around this article we found which contains the backstories to everything in Animal Kingdom’s Pandora. Below is the link to that article. And, in case you were wondering about Boba Balls, here is what we reference on the show. Jambeaux, everyone!!! Harambe! On this episode, we review the latest live action Disney film, Beauty and the Beast. On today’s show, we present Danny, Lee of Magical Moments Vacations, and Eli of Ivory Comics. For today’s Hub, we are reviewing the latest live action Disney film, Beauty and the Beast. Yes, it is the official live action remake of the 1991 animated classic. Beauty and the Beast was released in the USA on March 17, 2017 and exploded onto the scene with a $170 million dollar debut. This opening set a new record of March openings. Belle is played by Emma Watson, best known for her role as Hermione from the Harry Potter movie franchise. Beast is played by Dan Stevens, best known for his role as Matthew Crawley from the TV series, Downton Abbey. Here are some more names you may recognize. Kevin Kline is Maurice, Ewan McGregor is Lumiere, Emma Thompson is Mrs. Potts, and Josh Gad is LeFou. If you will remember, there was a big ordeal surrounding the fact that LeFou was announced as being an openly gay character in a Disney film. But, what impact did this really have? The director is Bill Condon, costumes are by Jacqueline Durran, and the music is by the one and only, Alan Menken. Have you seen the movie yet? What did you think about our review? Any comments? Share them at show@magicourway.com. Jambeaux, everyone!!! Harambe! On this episode, we speak with voiceover professional, Kat Cressida. On today’s show, Kevin is flying solo through this interview. For today’s Hub, we are exploring the artistic side of things as we present to you voiceover professional, Kat Cressida. To the Disney universe, she voiced the “The Black Widow Bride” in the Haunted Mansion. Before this, she voiced “Dee Dee” on the hit Dexter’s Laboratory for Cartoon Network. You can also hear her on ESPN’s Pardon the Interruption. She has also voiced numerous movie trailers and national campaign commercials. Also, she is known as one of the top professionals in celebrity voicematching. What is voicematching, you ask? Well, listen to the show and find out. But, she has recently matched Helena Bonham-Carter, Rachel McAdams, Jodie Foster, and Joan Cusack, just to name a few. In addition to Dexter’s Laboratory, you can hear her numerous animated hits such as Archer, Phineas and Ferb, and Toy Story 3. In the world of video games, she can be heard on such titles as Fallout, World of Warcraft, Arkham (Batman), Disney’ Infinity, and Star Wars voicematched as Princess Leia. Follow this link to her website, http://katcressida.com/home.html, in order to learn more about her as well as hear her in action. However, there is a very good chance that you have already heard her in action. You can also follow her on Facebook and find her on Twitter and Instagram: @KatCressida. Jambeaux, everyone!!! Harambe! On this episode, we work our way through Entertainment Weekly’s Disney Movie Song March Madness Bracket. On today’s show, we have Kevin, Danny, Lee of Magical Moments Vacations, and Eli of ivorycomics.com. Out special guest today, is Office Buford T. MOWican, Kirk Landry, Head of Security for the MOWican Nation. For today’s Hub, we work our way through Entertainment Weekly’s Best Disney Movie Song March Madness Bracket. In a February 2017 edition of Entertainment Weekly, the magazine published it’s march madness bracket based on Disney Movie Songs. 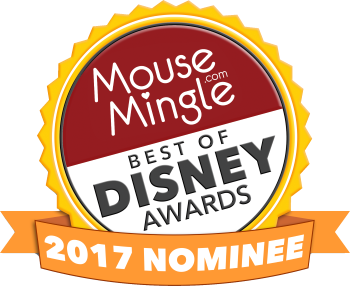 You can access the bracket and vote on their website HERE. You can listen to the clips on Entertainment Weekly’s website or you can access all of the songs through Magic Our Way’s YouTube playlist located below for your convenience. Listen and see what song won the whole thing for us. Play the bracket on your own and let us know what song came out on top for you. Share your findings at show@magicourway.com. Jambeaux, everyone!!! Harambe! It’s a Queue and a Hub show! 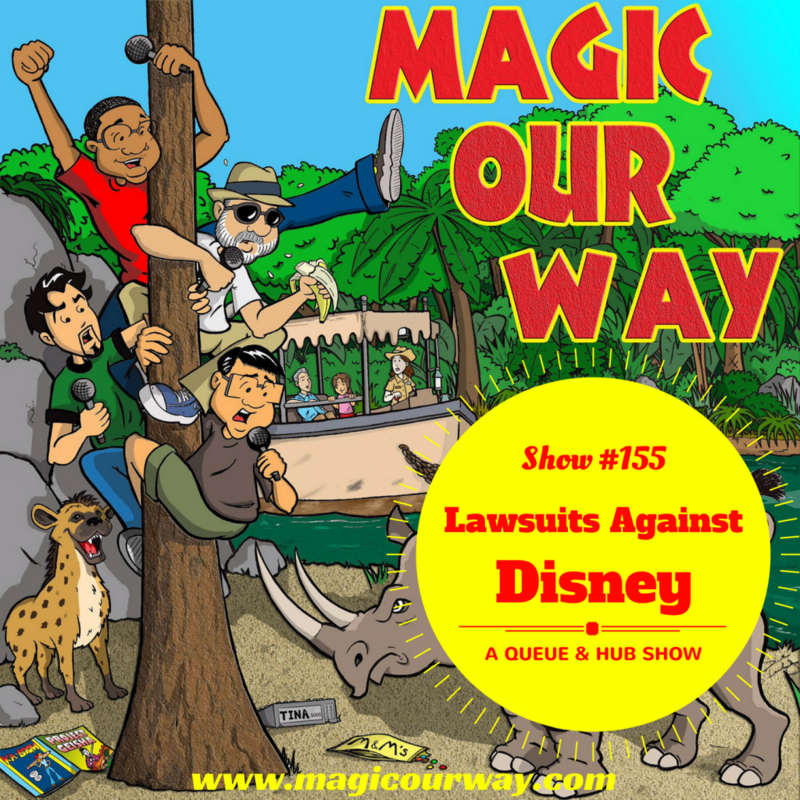 Over the years, The Walt Disney Company has had some interesting lawsuits brought up against it and we discuss them on our show. Welcome to another episode of the Magic Our Way podcast, a New Orleans based Disney fan podcast. Thank you for listening to our show and we hope it brings a smile to your face. We appreciate your feedback and we listen to our audience. On today’s show, we have Kevin, Danny, Lee of Magical Moments Vacations, and Eli of ivorycomics.com. Out special guest today, is Chief Woo Woo, @FishSeanWoo, Chief of the MOWican Nation. In the Queue, we talk about one of the recent Lawsuits that has been brought up against the Walt Disney Company. There have been charges brought up against Disney by two individuals claiming to have sustained injuries on the Tomorrowland Transit Authority Peoplemover attraction. The Peoplemover is a slow-moving attraction that gives riders a tour of Magic Kingdom’s Tomorrowland. Below is the article for your reference. In the Hub, we continue our discussion initiated by our Queue topic. We wanted to see what other Lawsuits that have been brought up against the Walt Disney Company. We found some to be silly, some that are urban legend, and some that were dismissed in court amongst the list of stories. Below are the articles we reference in this episode. What did you think about our game show? What Lawsuits have you heard about? Any comments? Share them at show@magicourway.com.